On behalf of Iraq and Afghanistan Veterans of America (IAVA) and our nearly 400,000 members and supporters, thank you for the opportunity to share our views on these bills today. Mr. Chairman, we support your legislation which would expand examination authority for physicians that examine veterans’ claims for disability compensation. Too often, veterans continue to wait for long periods of time to receive decisions on their claims for disability compensation. Extending examination authority and extending contracts with licensed physicians will ensure efficiency in this process, and will go a long way to eliminating redundant medical examinations. This bill will aid the VA in meeting its goal to provide veterans timely and accurate medical examinations. IAVA supports this legislation. This legislation would provide flexibility, regardless of the date of death of an individual, to be eligible to receive a medallion or other device to signify veteran status. This legislative adjustment would serve the interest of our veterans and their families and we support Chairman Miller in introducing this bill. IAVA supports this legislation. This legislation addresses a problem that impacts veterans’ rights relating to the second amendment. Due to some injuries or health conditions, a veteran may become eligible for caregiver benefits administered by the VBA. VA can make the determination that a veteran receiving treatment for an injury is in need of assistance and thus be eligible for support services such as the caregiver program. Often times, these veterans may be eligible for their caregiver or spouse to receive a stipend or power to assist and administer their finances. The problem that is occurring is that VA is making the leap from the determination that a veteran may need assistance with their finances, to labeling the veteran unfit to handle a firearm. In other words,the message being sent is if you can’t handle your finances, you cannot handle a firearm. Each case should be examined on a case-by-case basis. This legislation would require a judicial authority to make the determination that the veteran is a threat to their self or others. The veterans who have defended this nation — often rifle in hand — should have the same constitutional rights as any other citizen and these decisions should be made in the light of a judicial court and not a backroom office in the VA. IAVA supports this legislation. This legislation would express a Sense of Congress that military retired pay should not be offset or otherwise cut back because a veteran also earned, I repeat “earned”, disability compensation.This bill would also remove “phase in” periods for concurrent receipt, and for individuals who were retired and separated from the military due to a service-connected disability, make them eligible for the full concurrent receipt of disability compensation and either retired pay or CRSC. Let us keep in mind that these veterans — especially those that are eligible for CRSC — have sustained injuries in combat. These are the last individuals that should be the targets of federal savings. IAVA supports this legislation. This legislation requires the Secretary of the VA to study and report to Congress on a few key topic areas that relate to the issue of veteran burial and interment in national cemeteries under the authority of the National Cemetery Administration. This requirement would extend to identifying how many unclaimed remains exist and estimated figures. The bill would additionally require current VA procedure to be the subject of review, and further examine how those policies comport with state and local laws to allow the Secretary of the VA to administer in this area. The last key provision would require recommended legislative or administrative actions that can improve the way our government handles the remains of our veterans as we work to ensure they have a dignified final resting place. IAVA supports this legislation. This legislation requires that a VARO certify a veteran appeal submission within one year of receipt. In a time when too many veterans feel that the VA claims process moves at a glacial pace, we support legislative requirements that mandate timely action. IAVA supports this legislation. The administration of VBA benefits to fiduciaries serving our veterans is a very technical and difficult task and we greatly respect the work of the Department to that end, and this bill is seeking to make it work better. Our goal on this topic is to achieve the balance of ensuring the benefits are being paid and administered in such a way that accurately supports the veterans and their fiduciary, while at the same time not burdening them with excessive barricades to getting that support. This bill would clarify the roles of fiduciaries, to include a process by which temporary fiduciaries may be appointed to veterans. The bill also would provide a comprehensive set of reforms to supervise fiduciaries and clarify how investigations and results of those actions should be administered. This includes recourse for overpayments and misuse of funds. The support Congress has given disabled veterans and the collaboration with VSOs, especially in the years since the Iraq and Afghanistan wars, has been strong and we have some of the strongest benefits now more than at any time in history. However, the complexity of those benefits will require congressional oversight and perennial stakeholder input. 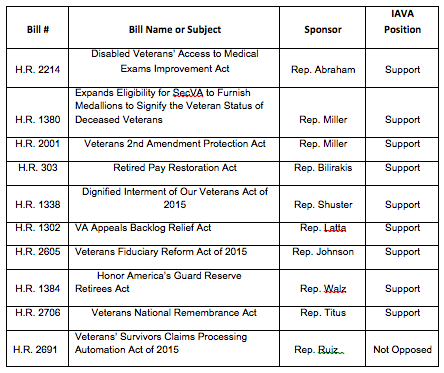 IAVA supports this legislation. Simply put, this does not create any new benefits but would allow our Reserve and Guard service members who serve on orders that are currently outside the scope of what classifies as “veterans” be given that title in law. This has been a long-standing TMC goal and IAVA joins Rep. Walz and our allies at TMC in supporting this bill. We support this legislation which would give the Secretary of the VA the authority to prioritize the placement of a future veterans cemeteries in a state that does not have one or otherwise serves a large portion of veterans. IAVA supports this legislation. We do not oppose the legislation but require more time to study the measure in concert with engagement from our membership. Mr. Chairman, IAVA appreciates the opportunity to offer our views on these bills. Thank you and I am happy to answer any questions you may have. As Legislative Associate at IAVA and former military police sergeant and Iraq war veteran ,Mr. Neiweem maintains congressional relationships and supports policy priorities. He spent 6 years in the U.S. Army Reserve as a military police NCO and served a tour of duty in 2003 during Operation Iraqi Freedom detaining Enemy Prisoners of War (EPWs), and performing base security and customs in during the Iraq war. 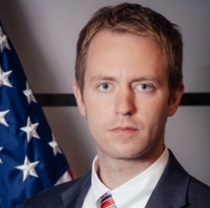 He holds both a Bachelor’s and Master’s Degree in Political Affairs and has been advocating for veterans nationally since 2011. 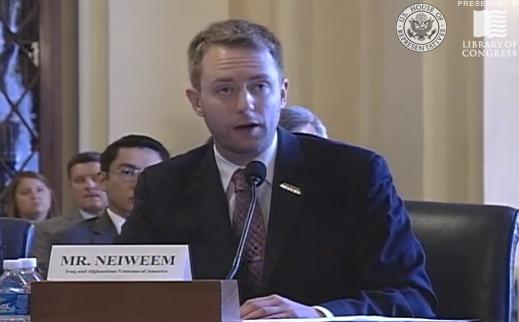 Mr. Neiweem routinely provides editorial support for IAVA’s policy priorities and has appeared in multiple local, state, and national media outlets supporting post-911 veterans. His policy portfolio covers veterans’ health, benefits, and he has specialized in education issues, with an emphasis on holding for-profit colleges accountable.